Despite its historic significance, Rome’s Tiber River has become extremely polluted. 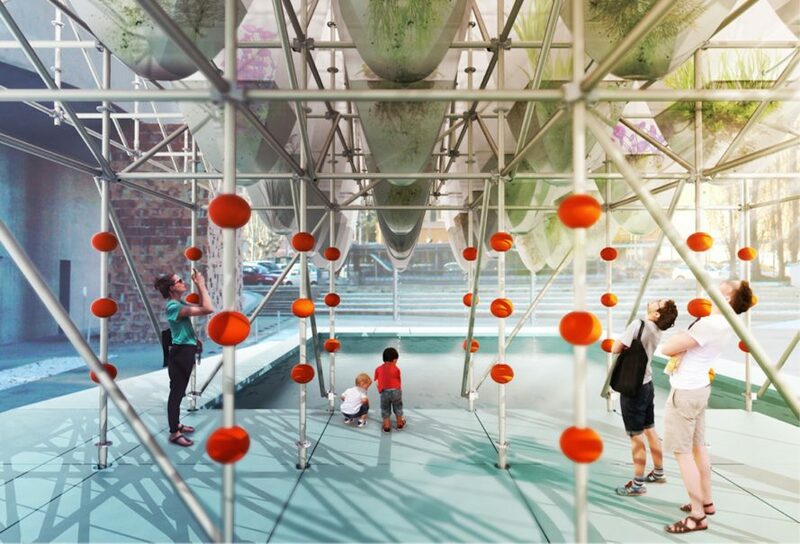 In a bid to clean up the murky, trash-infested waters, deltastudio designed Albula, an interactive floating structure that combines elements from historic water mills with bio-based techniques like phytoremediation. Even better, the Albula is designed as an open-source and scalable project that can be replicated in a variety of contexts. 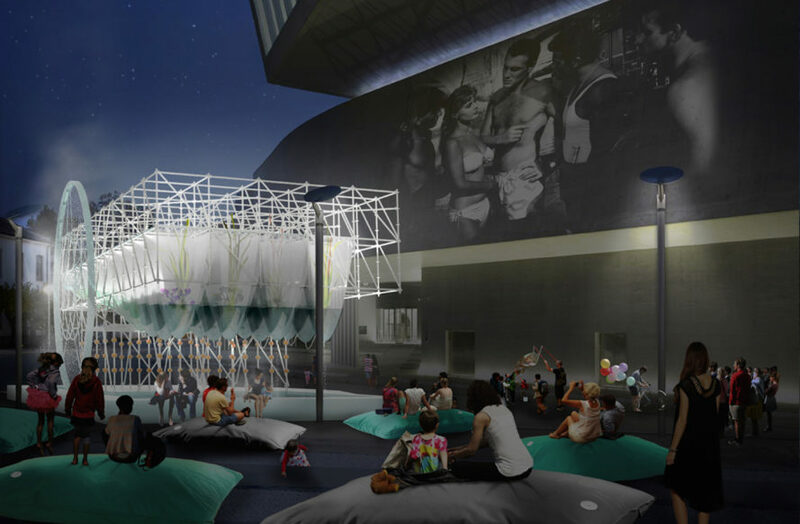 Recognized as a YAP MAXXI 2016 finalist project, the Albula installation was proposed for the public square in front of the Zaha Hadid-designed MAXXI museum of contemporary art and architecture. The project comprises four main elements: a platform, a T-shaped metal frame, a waterwheel, and a water storage tank. Suspended bags filled with plants and water from the Tiber River hang from the metal frame and provide shade, cooling, and visual interest. The plants are thought to function as filters that clean the water of heavy metal and pathogens. The hydraulic water wheel is hooked up to an electric motor and Arduino, a programmable low-circuit board, which powers the motor when motion sensors are triggered. As more people gather around the installation, the wheel will facilitate greater water flow within the hanging sacks. Recognized as a YAP MAXXI 2016 finalist project, the Albula installation was proposed for the public square in front of the Zaha Hadid-designed MAXXI museum of contemporary art and architecture. 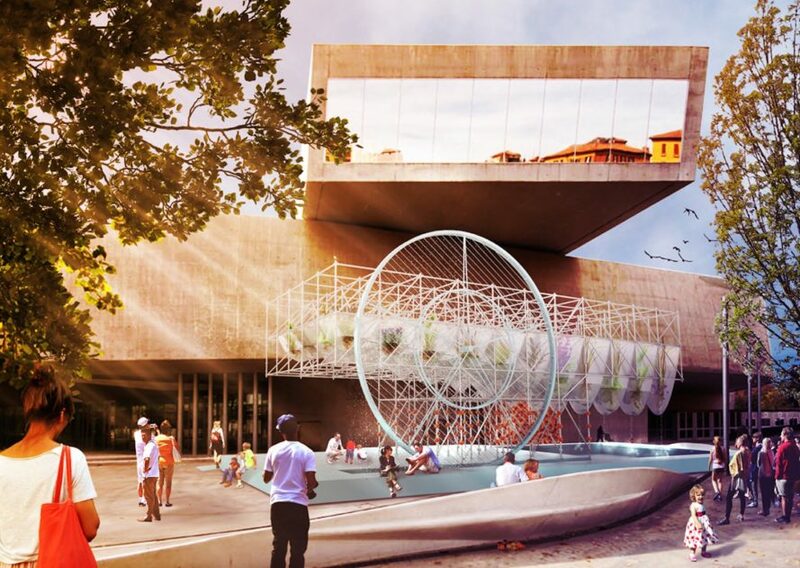 The project comprises four main elements: a platform, a T-shaped metal frame, a waterwheel, and a water storage tank. Suspended bags filled with plants and water from the Tiber River hang from the metal frame and provide shade, cooling, and visual interest. The hydraulic water wheel is hooked up to an electric motor and Arduino, a programmable low-circuit board, which powers the motor when motion sensors are triggered. As more people gather around the installation, the wheel will facilitate greater water flow within the hanging sacks. The plants are thought to function as filters that clean the water of heavy metal and pathogens.